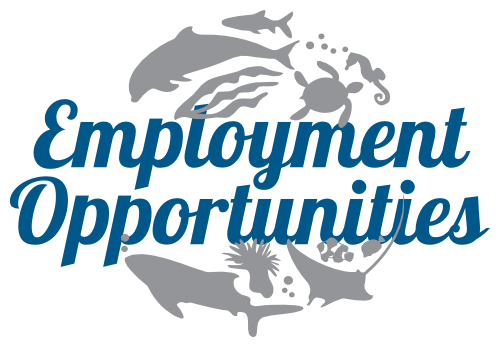 My fifth month as Kuda Huraa’s marine biology intern has drawn to an end, with plenty of tasks to be getting on with. 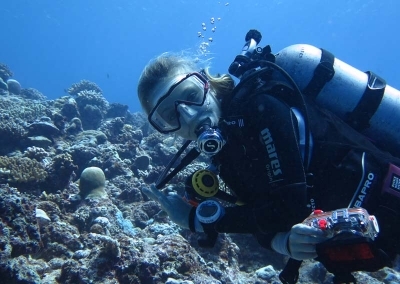 Unfortunately, the sea surface water temperatures around Kuda Huraa were regularly reaching 32-33˚C, meaning that coral bleaching is becoming an ever-present sight when we are monitoring our coral frames. The shallow channel site in particular has suffered greatly as a result of the high water temperatures, and both our frame colonies and wild colonies are showing strong signs of bleaching. 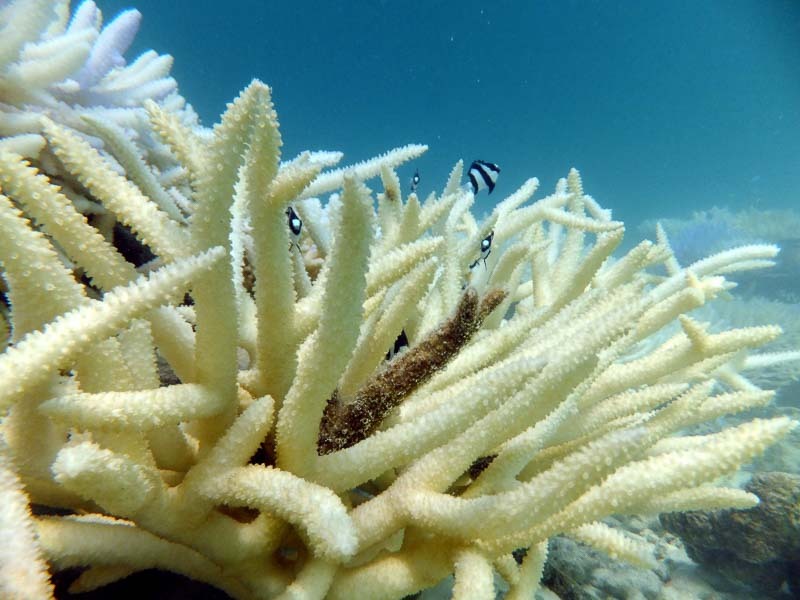 Certain frames at this site have been selected to be monitored on a weekly basis in order to assess the levels of bleaching and any potential for recovery. 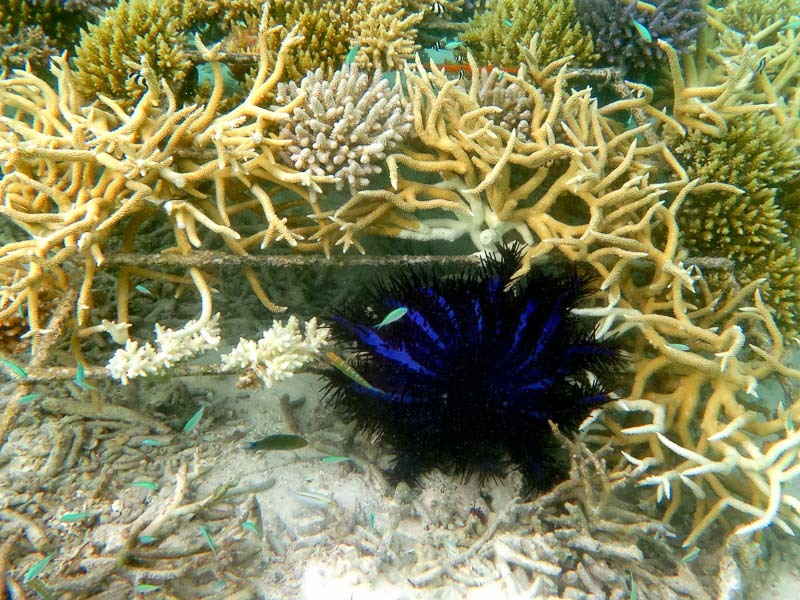 Monitoring of our 800 house reef coral frames is well underway and so far 21% of the house reef has been monitored. Frames here are located at varying depths from 2.5m down to 12m. Some of the deeper frames are doing particularly well and have managed to avoid bleaching and COTS predation. This is a likely result of the temperatures at 12m being slightly cooler, at approximately 29˚C. 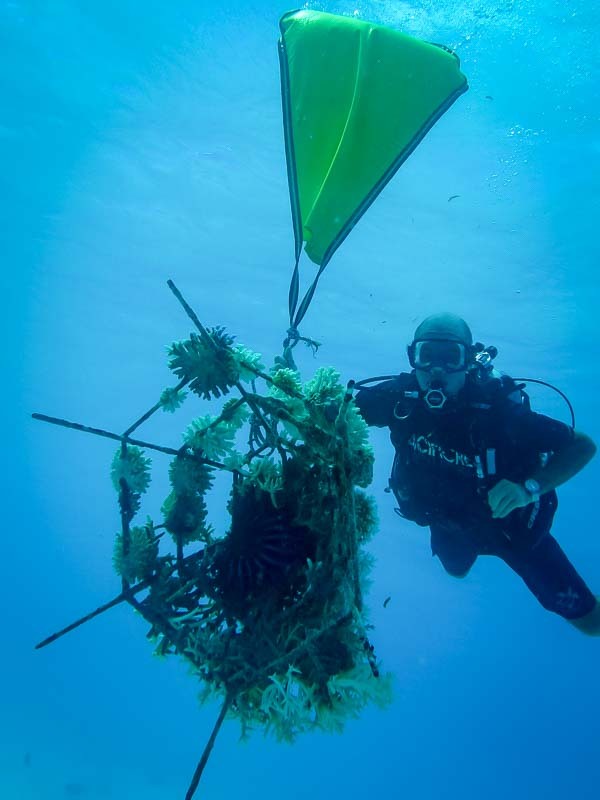 In spite of this, an extensive amount of COTS damage has been observed on the house reef over the last few months and so a large percentage of the frames will have to be re-transplanted prior to being monitored. We are hesitant to begin re-transplantation due to the large amount of bleaching that has occurred. 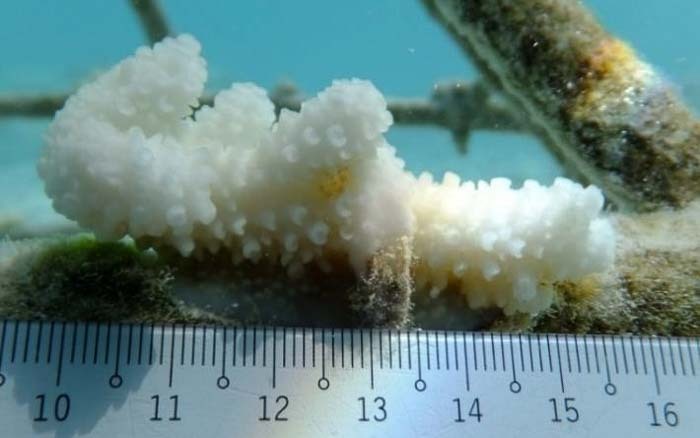 Fragmenting wild colonies that have the potential to survive the current high water temperatures is risky as the mortality rates of smaller sized fragments is high. If we were to begin re-transplanting and fragmenting surviving wild colonies, the fragments would likely bleach once on the frames. This is something that will be the focus in the next month or so, once temperatures begin to decrease. My project is also at a critical point, and unfortunately a large number of my surviving fragments have bleached and are showing signs of partial mortality. I can only continue to take my weekly measurements and hope that they can pull through the next 4 weeks. I expect there to be little growth over my final weeks as the fragments will now be investing energy into survival rather than growth. Despite this, I am remaining positive and I still have some good data with which to go on when making my conclusions on the ideal fragment sizes to use in propagation techniques. 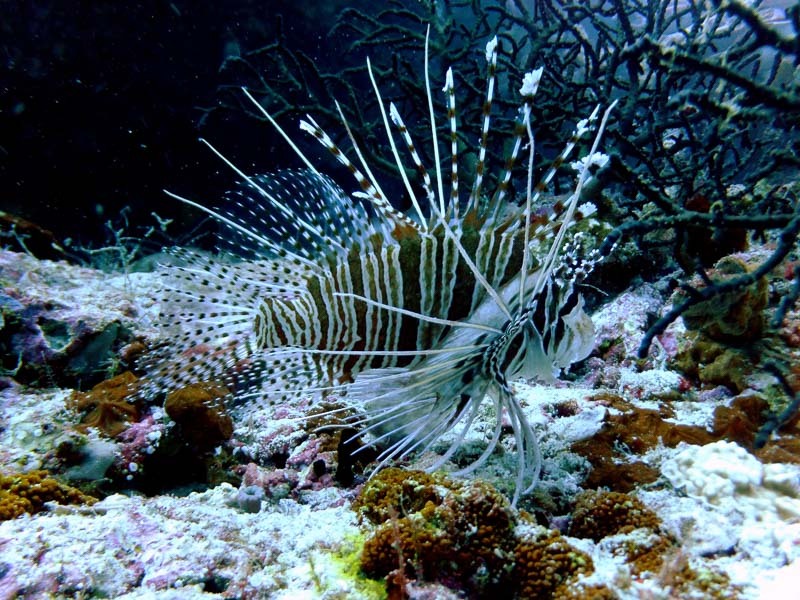 The wonders of the Maldivian marine life still continue to impress and amaze me whilst snorkelling and diving; I have frequently witnessed lionfish, scorpionfish, batfish, stingrays, sharks and napoleon wrasse (to name a few). 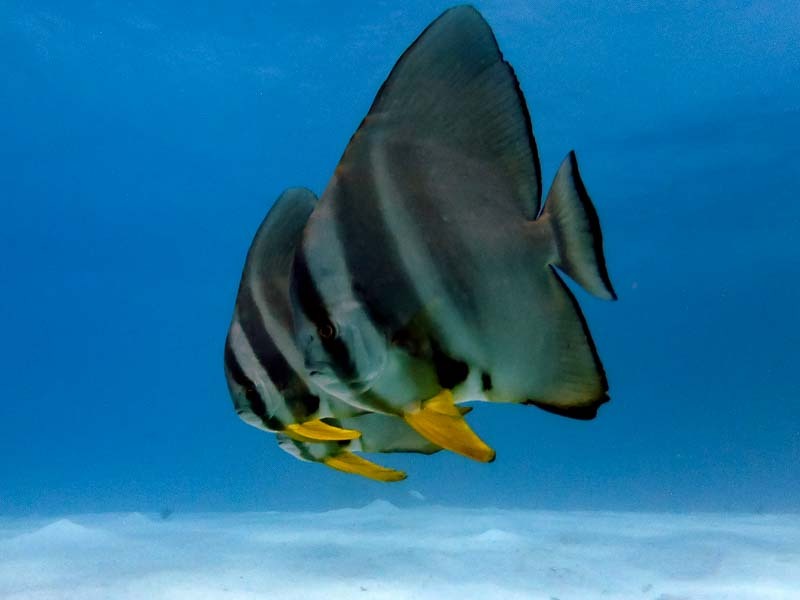 The waters have been calm and clear and this has given plenty of opportunity to get some good snapshots whilst completing surveys and monitoring. For the first time, I have also seen Risso’s dolphins whilst on our dolphin cruise excursion. We saw large splashes in the distance and I thought at the time that these splashes were way too big to be the ‘usual’ Spinner Dolphins we see. As the boat approached, we could see the distinctive black colouration and long, thin fins protruding from the water. The pod was small and very elusive. We thought there may be some juveniles amongst them and the mothers were being protective. 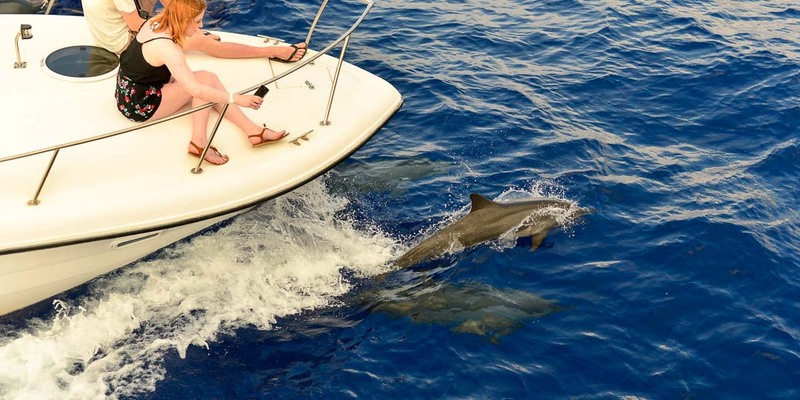 The Spinner Dolphins have impressed as well this month, bow-riding and riding the wake at the back of the boat regularly, incorporating jumps as they go. 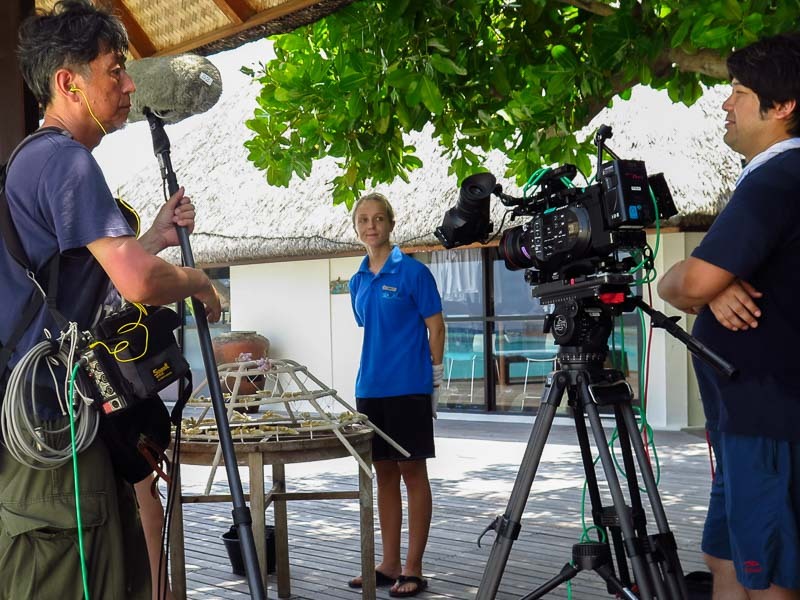 My life as an ‘island model’ continues and this month I was privileged to have taken part in a Japanese television episode of “The Secrets of Paradise” concerning the Reefscapers programme at Kuda Huraa. We made a coral frame, then deployed it in a deep cluster of frames on our house reef site; all whilst being filmed by a professional camera crew! I had to do a short ‘piece-to-camera’ but luckily for me it was mostly a non-speaking role! This month has also seen the arrival of the Four Seasons Apprentice class of 2017. To kick off their introduction to the MDC we made a medium-sized coral frame with them. They were highly enthusiastic and keen to ask questions which made the experience more rewarding. 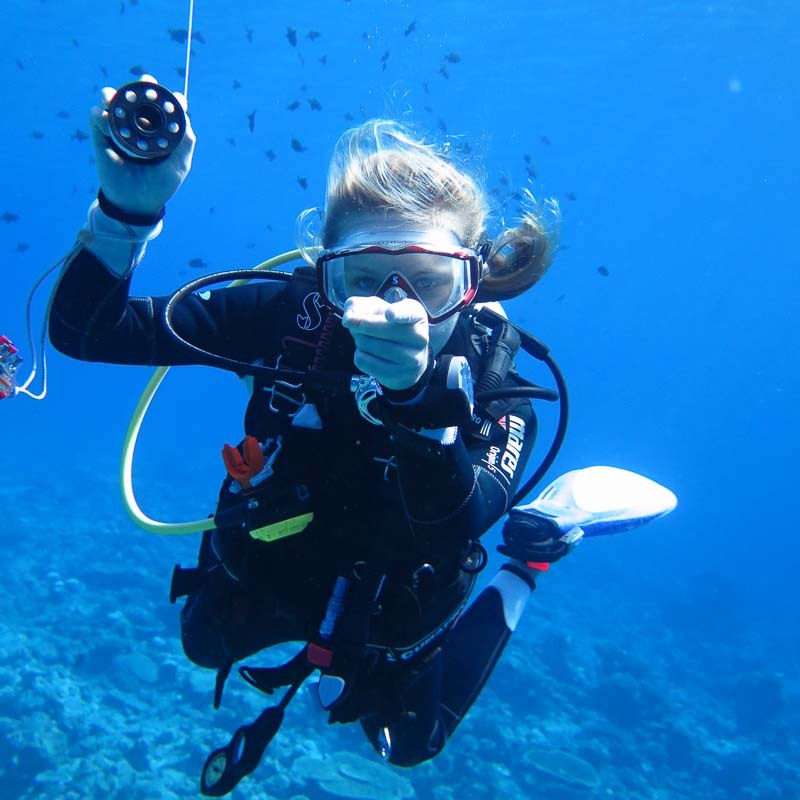 As part of their experience, Dhaanu and Moadhu – the 2 dive apprentices – have been thrust into the MDC until June to help out with our daily duties. Both shy at first, they are coming out of their shells and have so far been a great asset to the team. So my 6 months as an intern with Seamarc is finally coming to an end. I have thoroughly enjoyed the opportunity and have met some wonderful people and been able to see some spectacular things along the way. 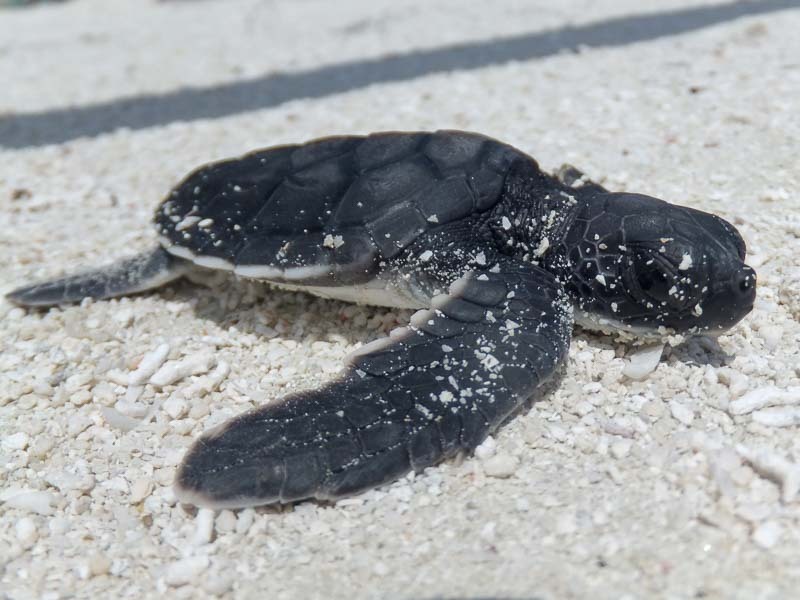 My final month has seen the arrival of five new Green Sea turtle hatchlings; Tony, Oscar, Rex, Kasbawa and Bodhi. All 5 hatchlings are doing well, with Tony showing considerable signs of growth because he eats all his food so quickly! Rex was a slow-starter but is putting on weight and catching up with the others. 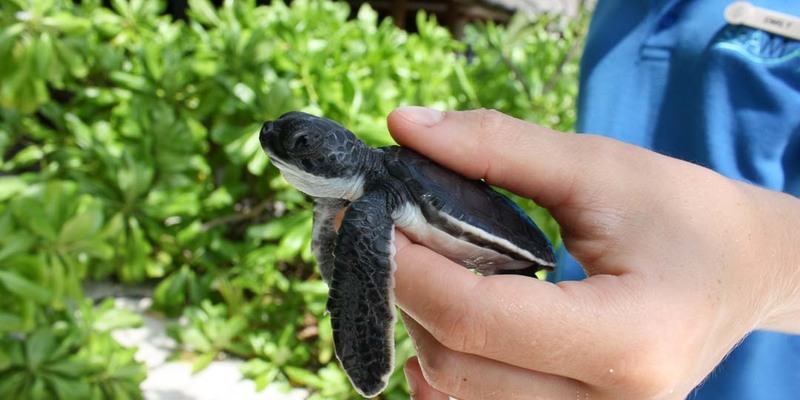 I am positive that under the care of our turtle biologist they will reach their release size over the next year or so and be ready for the big open ocean. 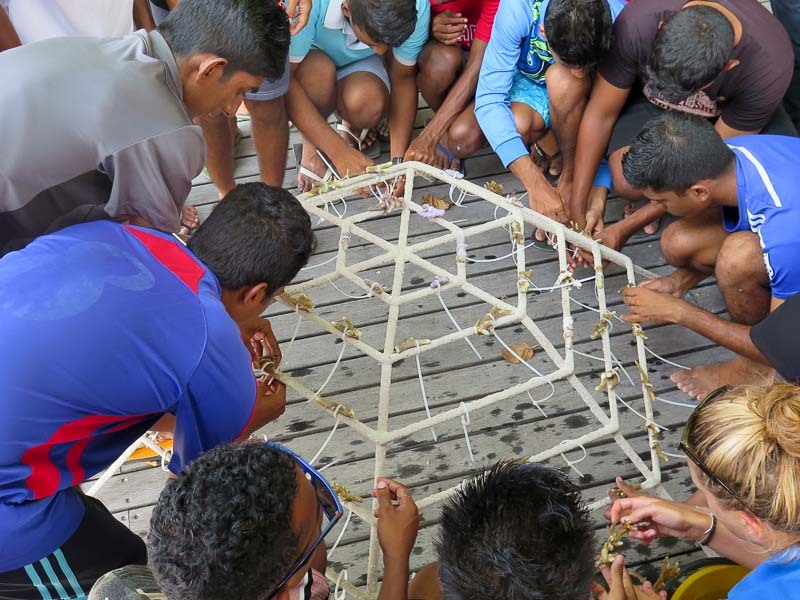 I have also been helping to complete the fish monitoring data collection we regularly undertake; which is being used as part of a project being conducted by MoFA (the Maldives Ministry of Fisheries and Agriculture). 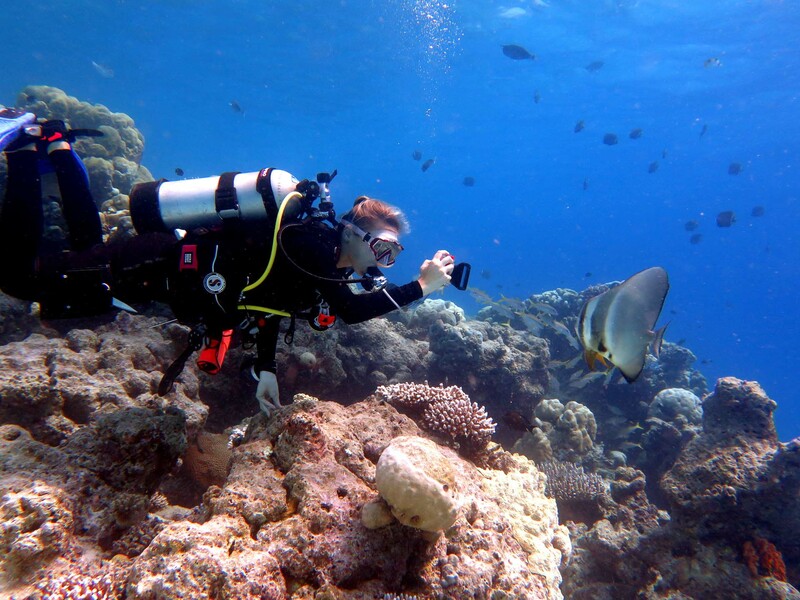 I have had the opportunity to see fish such as coral groupers, golden trevally, giant trevally and even a few yellow-fin tuna. 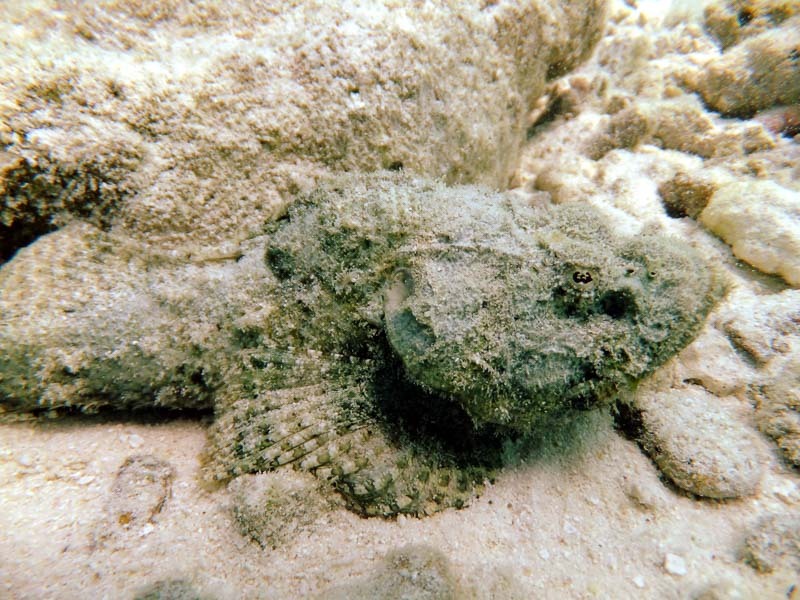 The fish are measured and photos taken of the largest and smallest of each species. The data is then sent to MoFA for evaluation. 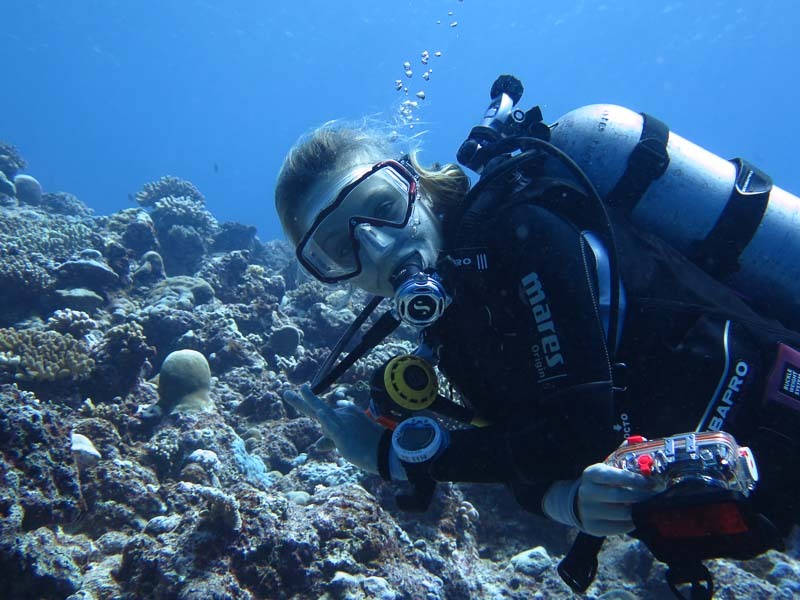 We have also been continuing our quest to monitor the 800 coral frames on our house reef site, which is now 50% complete. 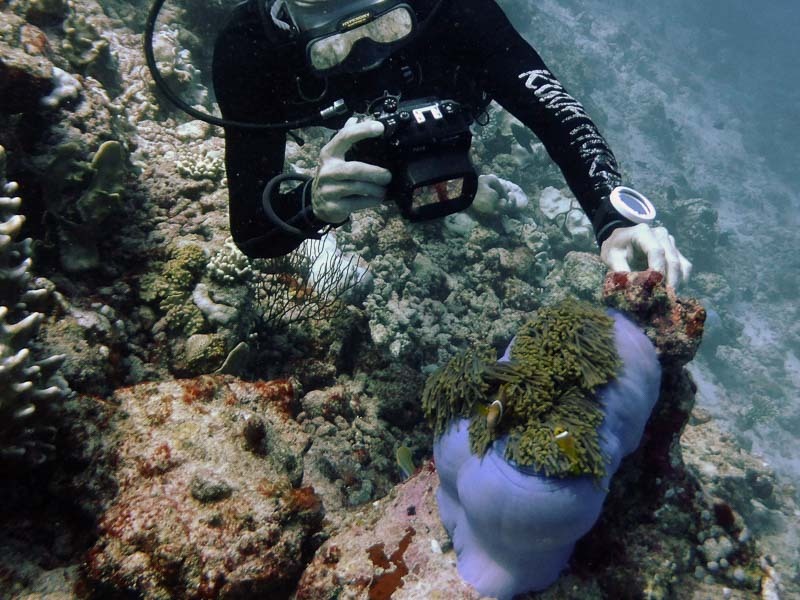 Efforts have also been made to try to move some of the coral frames (using lift bags) to deeper sites on the reef, in an attempt to combat the increased sea temperatures and high light intensity which is causing bleaching. Frames from around 4m depths have been moved down to 13m where there is less light penetration and the water temperatures are slightly cooler at 30-31°C. 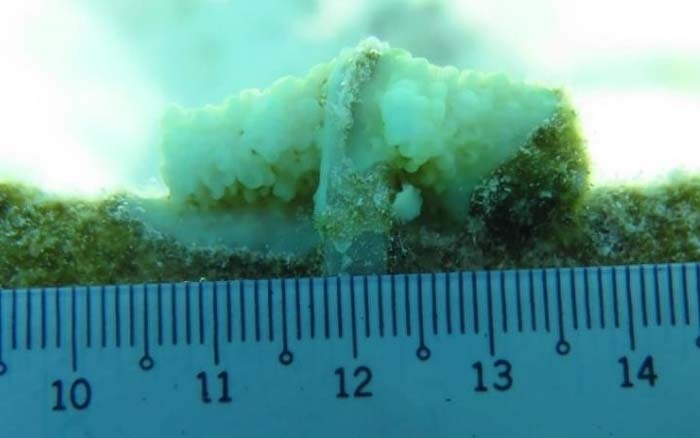 My personal coral growth project has drawn to a close and sadly, with the increased sea temperatures we have seen over the last few weeks, all of the fragments had suffered mortalities by the end of the experimental period. I am in the process of analysing the data and have obtained some useful findings regarding the ideal fragment size to use in propagation techniques. The temperature data also revealed some interesting trends, particularly a distinct increase between the months of April and May, compared to previous months. This will be useful in offering future insights to explain the thermal tolerances of corals and can hopefully be used by the team as a baseline comparison for future records. I am hoping to publish my findings in due course and have enjoyed completing the project as it has given me an increased knowledge of experimental design and how to approach writing a scientific paper intended for publication. I am keen to use these skills in my future endeavours and hope to progress into more research-based roles as a result. This month has also given me the opportunity to see my first ever reef manta ray on one of the survey dives we completed at Lankan Caves dive site. It was a spectacular sight and I consider myself extremely lucky to have seen such a graceful animal. It only passed for a brief moment but what a sight it was! It is certainly one of the highlights of my internship and something I will not forget in a hurry. I was lucky to see a total of 4 mantas whilst on Kuda Huraa and even got to see two mantas at a cleaning station. Both mantas swam through our dive group, getting extremely close! To mark the end of my time here I have been trying many different activities on my days off, including diving, surfing and water-sports, and even the ‘fun tube’ and banana boat rides. We were pulled behind a speedboat for 25 minutes and the ride was certainly bumpy but a lot of fun! 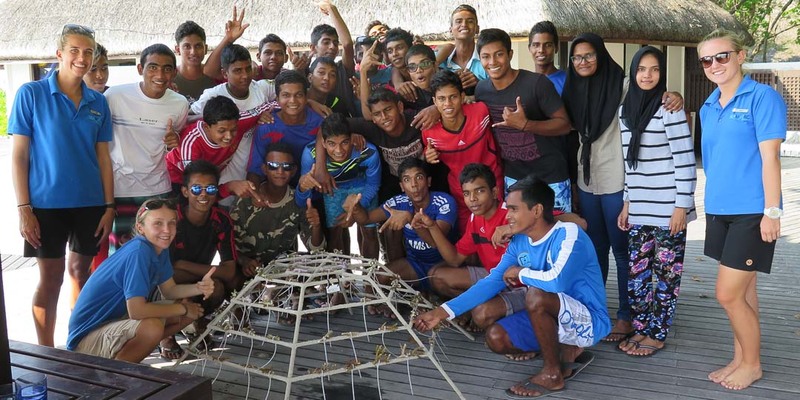 These activities, along with the people I have met along the way, have completed my internship at Kuda Huraa and made the experience so enjoyable and memorable. I wish to thank everyone at the MDC and the staff at Four Seasons Kuda Huraa for making my time here so special and I thoroughly look forward to keeping in contact.